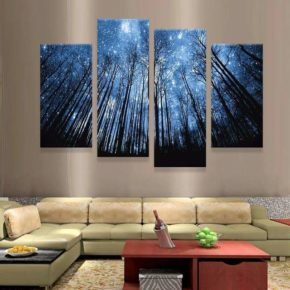 Four rectangular paintings of various sizes are placed above the angular sofa , they depict a forest of trees, where there is a vision of sky and stars in shades of blue. As you find yourself in a mystical world of nature and the cosmos. These paintings create the whole atmosphere of the living room, provide it with imagination and inspiration for the mysteries of life and the world around us.